Dan Szymborski has already laid out why Ozzie Albies’ recent extension with the Atlanta Braves is surprising, and a bargain for the team. He detailed the hundreds of millions of dollars Albies is potentially giving up by signing this contract. This post deals less with Albies’ future and more with his past. We can speculate on what Albies might do in his career and what he might be worth, but we don’t need to speculate about what he’s already done and what other players in similar situations have received in contract extensions. Since 2014, nine players have signed contract extensions after accruing at least one year of service time and less than two. These were all players needing five full seasons to reach free agency, and each signed away at least one year of free agency based on a search of MLB Trade Rumors. 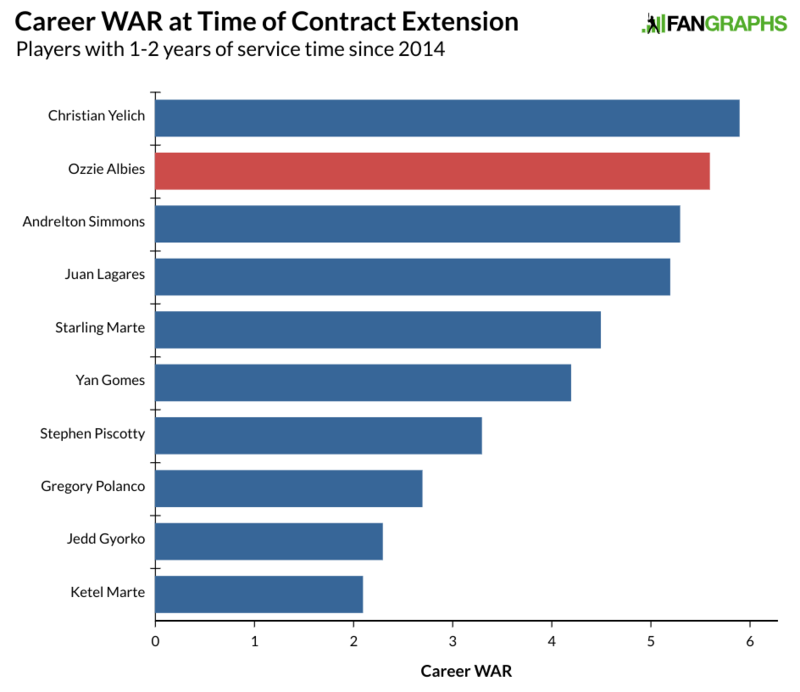 Here’s the career WAR of each of those players when they signed that contract. Albies compares favorably to the two best players on this list, Christian Yelich and Andrelton Simmons. Now, here’s how each of these players did on their guarantees. Yelich and Simmons got over $50 million each, but their guarantees were about 50% higher than the one Albies just got. Generally, teams pay extra for free agent years. Here’s how many free agent seasons the above guarantees bought out. So Albies gave up more free agent seasons than any similar player despite a top production profile and a middling guarantee. When we look at the payments closely, it gets even worse. Here’s how much money the above players received or will receive through one free agent season. Simmons got double what Albies will receive, and there’s a fairly clear precedent for every other contract in the $30 million to $35 million range. We don’t know Albies’ number for sure, but the $24 million figure above is based on the $35 million guarantee that includes a $4 million buyout and an assumption of a $7 million salary in 2024. Here’s what it looks like through two potential free agent seasons. Juan Lagares drops off this list, as he would become a free agent. The numbers for Albies don’t include a $4 million buyout, but that still places him well behind every other extension save for Gomes. Even worse for Albies, while Polanco, Yelich, and Marte all have options worth at least $13.5 million for one season before they hit free agency, Albies signed away two more seasons for $14 million, which is really only $10 million more when the $4 million option is taken into account. When Ronald Acuña signed his contract, I concluded with the following paragraph that could apply equally here by substituting Albies’ name and a few other relevant facts. We should look at the big guarantee for a player with Acuña’s service time, note that it secures Acuña for life, and understand how tough it would be pass up that kind of money given that we don’t know or understand Acuña’s motivation or circumstances. 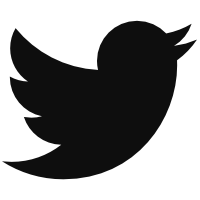 We can bemoan a system that suppresses salaries for more than half a decade. Those factors are all ones we should consider with contracts of this type, but we also need to consider what the player has potentially given up, as well as reasonable alternatives that meet some of the same goals. The balance between the guarantee is the free agent seasons, as well as the potential arbitration awards. 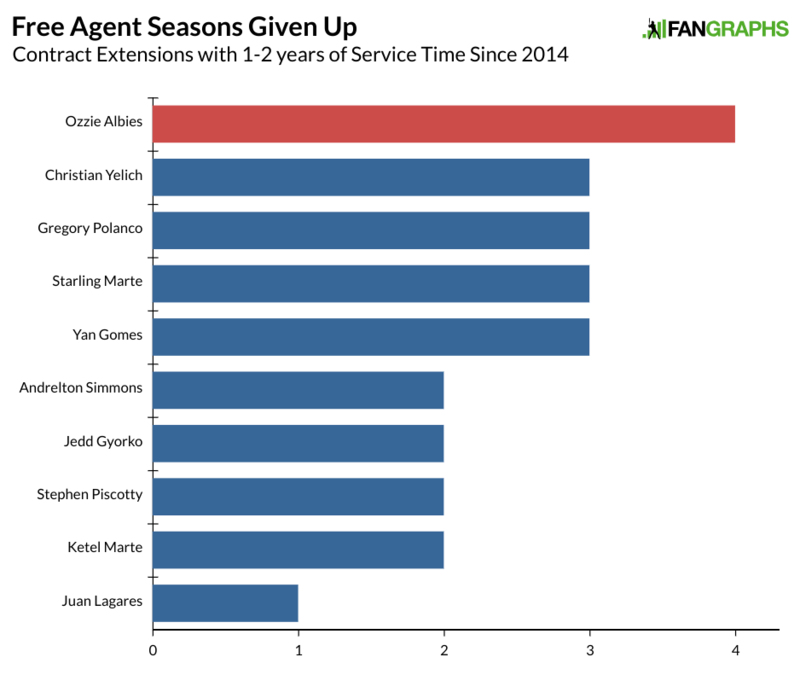 Players simply haven’t given up four free agent seasons this far from free agency, especially players of Acuña’s caliber. A guarantee for half that amount that ensured that Acuña hit free agency in his 20s likely would have been a better deal for Acuña and a positive deal for the Braves. This deal isn’t a steal because of the system that players and owners have set up. This is a deal that, even within that system, will likely prevent Acuña from ever being paid at a level anywhere near his true on-field value. Albies deal doesn’t make much sense when compared to similar players. His two best comps, Yelich and Simmons, received significantly larger guarantees and signed away fewer free agent seasons. The table below includes much of the information above, as well as the average MLB payroll at the time of the contract. Since Simmons signed his deal, contracts have increased by about 25% while they’ve increased by about 15% since Yelich signed his deal. Even within the context of team-friendly extensions, Albies’ deal stands out. We hoped you liked reading Here’s Why the Ozzie Albies Deal Was Terrible by Craig Edwards! LOL what? Literally zero of my salary is dictated by agents, players, the MLBPA, or contract negotiations with an MLB organization. Do we think there are any other factors in play besides those? I’m 99% sure OP is Ozzie Albies’ agent. Pretty sure this is a racist’s attempt at a joke. This is the most nonsensical comment I’ve ever seen on Fangraphs. When’s Serbian to Viatnamese to Klingon and Back?